Home > Travel > Flight > Budget Airlines > [Jetstar]  Unlock your $0* sale fare to 4 other destinations this week! 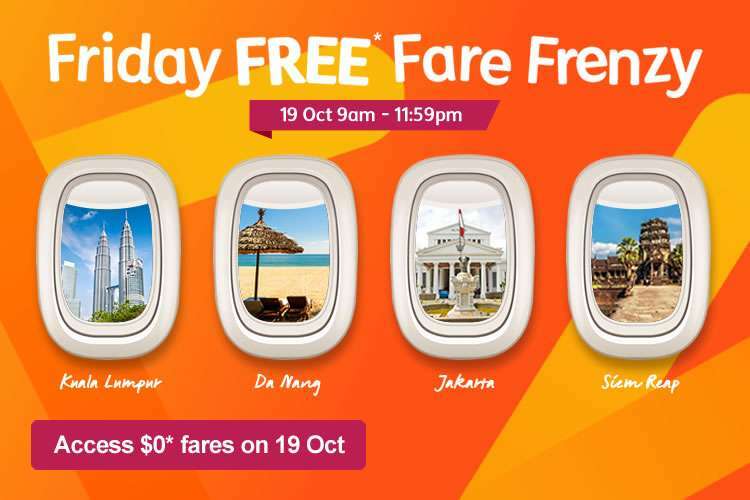 [Jetstar]  Unlock your $0* sale fare to 4 other destinations this week! $0* to Da Nang, Siem Reap, Jakarta, and more! Set your alarm for tomorrow. * Taxes, fees and carrier charges apply in addition to the fare quoted. Sale starts 19 Oct 9am and ends 11.59pm, unless sold out prior. Other T&Cs below. * Club Jetstar has a joining fee of $48. The $49 annual membership fee will be waived for the first year. For full details, please read the Club Jetstar terms and conditions. * Fares are one-way. Prices are quoted in Singapore Dollars and exclude taxes, fees and carrier charges which are payable in addition to the fare shown. A booking and service fee per passenger, per flight will apply. * Economy Starter fares come with 7kg carry-on baggage only. Carry-on baggage limits, including size restrictions, will be strictly applied. Passengers with more than the applicable carry-on baggage allowance will need to check in baggage, and charges will apply. More details on carry-on baggage.